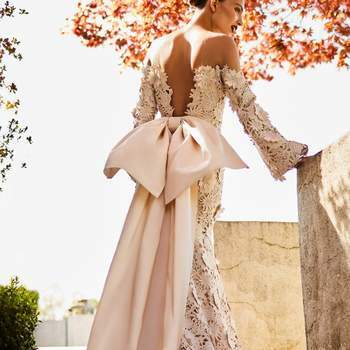 Colombian fashion designer Johanna Ortiz is rightfully well-known across Latin America and the United States for her incredible style and talent, and so it holds water that her bridal collection should be similarly distinguished. Utterly romantic, and exquisitely constructed, this collection of gowns is one of the most beautiful that we at Zankyou have ever seen – the Latin influence is clear in the drama of the ruffles and floral details, but also in the names of the dresses, each of which bear the title of a classic in Latin American literature. The sheer excellence of this collection cannot be underestimated. 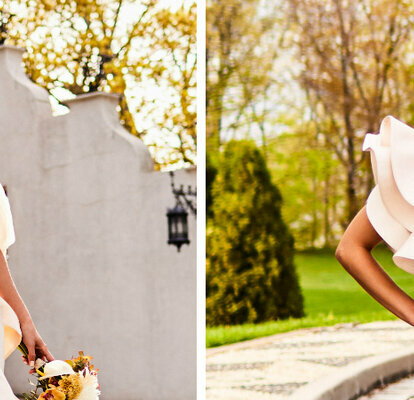 Incorporating soft blush pinks and working effortlessly with the most luxurious of fabrics such as silk crepe and charmeuse, Johanna Ortiz here creates sensuality, opulence, and a set of dresses that are unashamedly couture. For example, the waterfall of ruffles in the Noches de Andalucia gown, combined with the featherlight off-the-shoulder tulle sleeves and the elegance of the silk is luxury personified. The use of silk in many of the gowns – so often passed over in favour of satin and chiffon – adds an unparalleled sense of sophistication, whilst draping perfectly across the body. El Lenguaje de Los Flores. Credits: Johanna Ortiz. El Amor En Los Tiempos del Colera. Credits: Johanna Ortiz. Amores Como El Nuestro. Credits: Johanna Ortiz. La Leyenda del Beso. Credits: Johanna Ortiz. Cartas a Julieta. Credits: Johanna Ortiz. Una Rosa en Invierno. Credits: Johanna Ortiz. Antes del Amanecer. Credits: Johanna Ortiz. Atardeceres Sevillanos. Credits: Johanna Ortiz. El Arte de Amar. Credits: Johanna Ortiz. Noches de Andalucia. Credits: Johanna Ortiz. Amores Gitanos. Credits: Johanna Ortiz. Te Amaré. Credits: Johanna Ortiz.